If you’re thinking about refreshing the look of your hardwood floors, use this time to learn what to expect, whether you’ll complete the project yourself or engage an experienced flooring expert. Sanding a floor involves the utilization of heavy-duty rotary sanding equipment that may kick up a huge amount of dirt. Most rotary sanders incorporate a vacuum attachment, which will reduce the amount of dust kicking and protect your lungs. Seal Room Sanding creates fine dust and wood shavings that quickly become airborne and move to other rooms in your home. Use a plastic tarp or a masking tape to seal off doors. Use plastic sheeting or similar objects to block off area that you aren’t working on. Cover air vents, electrical outlets, and windows. The dust blown from these power tools could damage your electrical outlets or jam your windows and pose a fire hazard. Wear safety goggles and respirator gadgets. High-speed rotary sanders can blow small slivers of wood at very high velocities. Remember to examine your floor depth. If your current floor is just 1/4" thick, then consider hiring a floor sanding professional. The thin floor is very difficult to sand. You can easily sand down to the subfloor or weaken the structural integrity. Prior to attempting any sanding or refinishing operation on your floor, repair any gouges or splits for excellent floor sanding. Also, make sure that you inspect for metal nail heads. Ensure you sink any metal nail heads that you find to avoid damaging the sander head or shredding the sandpaper. Most homeowners are not familiar with using heavy equipment such as a drum sander, but using proper technique in sanding with these equipment is crucial because you could cause adverse damage to your floor otherwise. Work with the drum sander across the floor and in the direction of the grain. Ensure to make at least two passes over areas with grits of the sanding disks. Avoid dropping the drum sander on the floor after turning the machine off, because this may create slight gouges in your floor. You’ll need to use various grit types, start with the roughest and end with the finest. This is to ensure a smooth result and allow sealant and stain to adhere properly. If you’re using a rotary sander, ensure you’re consistent with the amount of time you spend sanding any particular area. If you sand one area for too long, you’ll bevel the floor, which will call for a challenging repair. Remove quarter-round and baseboard trim before you sand. Sanding may lower your floor height, which may create a gap between the floor and trim, and additionally scuff trim. After passing the sander on the whole hardwood floor, remove all Shavings and wood dust. A nozzle installed vacuum is the most efficient tool to clean the debris. After you’re done with the sanding, go over the entire floor twice with the vacuum to remove all shavings and dust. Wipe the entire floor with a cloth to make sure the surface is cleaned entirely before applying the finishing products so that the debris doesn’t embed on the floor’s top coat. 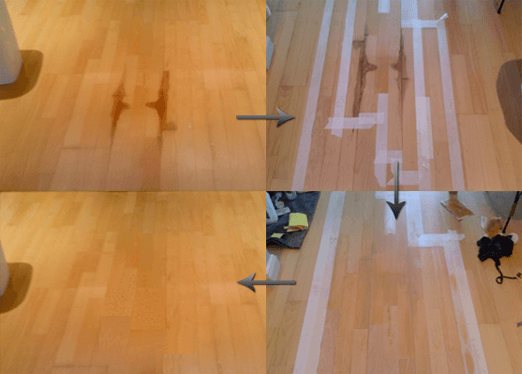 Hardwood floor sanding, if done right, can be a time-consuming task. Don’t give your money to a floor sanding contractors who’s not ready to invest in the appropriate time and effort to complete your job appropriately. Hire Acorn Floor Sanding for quality floor sanding in Wiltshire.